Amouage classifies Myths Woman as a green floral and lists among its notes narcissus, violet leaves, galbanum, carnation, patchouli, ambergris accord, leather, moss and musk. In a nutshell, it smells like a powdery narcissus wrapped in a velvet cloth spritzed with Jean Patou 1000 and Mona di Orio Cuir. I want a bottle. After spraying Myths Woman, for a split second I smell diffuse, tart green. It’s almost instantly overtaken by sepia-toned leather, hay and dirty ashtray with a hint of soap hanging around its edges. I’m not one of those people who automatically sees colors when she smells something, but a sniff of Myths Woman as it begins to settle unspools a black-and-white movie in my head. We’re in a dark bar with men wearing fedoras and women who don’t get enough sunlight. Dangerous things are happening. Slowly, the fragrance’s narcissus rises, pivoting Myths toward a more classic feminine fragrance, but still with lots of composting violet leaves, moss and animalic funk hanging over it like a stained chiffon scarf. Now we’re in the heroine’s boarding house room, and the elevated train rumbles nearby. Her dressing gown needs mending. It’s seen better days. So has the heroine. You can tell that she was beautiful once, and she cleaves to her ritual of bath powder and perfume, but the years have been rough on her. Eventually, the narcissus takes full stage, and the cigarettes and leaf mold retreat to just a whiff. Myths Woman’s narcissus will never have the joyful prettiness of, say, Parfums de Nicolaï Le Temps d’Une Fête, but now it smells much more like a straight floral. Myths Woman wears all day long and while I wouldn’t call it quiet, it isn’t an attention-hog, either. Maybe because it’s so unlike my life, I’m drawn to the drama in Myths Woman. I like it that it doesn’t pander to the crowd who takes its beauty easy to swallow. I don’t want to be Lily in Baby Face — who would? — but I sure enjoy the movie. 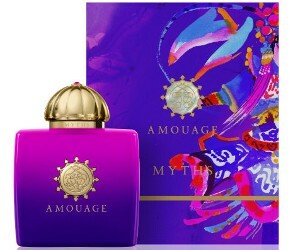 Amouage Myths Woman Eau de Parfum is $280 for 50 ml and $330 for 100 ml. For information on where to buy it, see Amouage under Perfume Houses. I’d already smelled Myths Woman by the time I saw that video, and was confused because it seems to have *nothing* to do with how the fragrance smells. 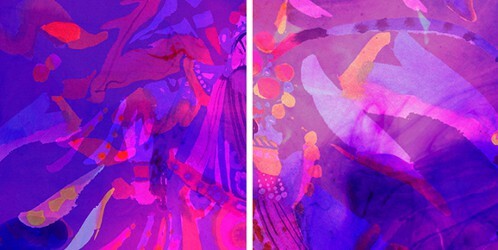 I managed to sample before I jumped in on a split – it strikes me as sort of a cross between PdN Le Temps d’une Fete, which I love, and vintage Jolie Madame extrait, which I also love. Darker and more leathery than LTdF, less violet/white floral than JM, but almost dirty in that good vintage way. Not sure I’d use a bottle (especially since I have backups of both of the others), but I’m enjoying my 5ml decant. I really like the juxtaposition between the innocent narcissus and the dirty, ashy overlay–I’m glad I’m not the only person who appreciates it! Enjoy that decant. Wow! As a work of art, your review is probably even better than the perfume, Angela! I’m inspired to seek out Myths now, whereas I had previously been ignoring the new Amouage releases with proud and haughty indifference, all pretended, of course, ‘cos the prices, oh my! Thank you, I think, for putting Myths on my field of attention. Oh, you flatter me, and I love it! It’s been hard for me to keep up with the Amouages, but I’m glad a sample of this one fell into my lap. It’s sort of a “mood” fragrance, maybe not right for every day, but just right for particular days. I wasn’t tempted by Myths until I read your review. You caught my attention with the mention of JM. Now I need to at least get a sample. Thank you for another great review! Ditto this! I may cough up some change for a very small decant to give it a proper test drive. A decant is the perfect way to go. Even the branded samples contain four or five wearings. Agreed, this review is quite an endorsement. I hope I didn’t oversell it! Myths intrigues me–it feeds right into my love of vintage drama–and I guess it shows. Definitely can’t afford. Sounds tempting, but I’ll stick with my Temps d’une Fete. Ever so much more affordable, and fills more of a hole in my collection. Amouage would be so much more tempting at a price point that didn’t assume a high six-figure salary…until then, I’ll just content myself with spending next week in Zürich and sampling more Tauers. I’ll smell intriguing anyway. Ha! Le Temps d’Une Fete is wonderful–you can’t go wrong with that if you like narcissus! You’re probably right–I hadn’t checked. That’s a shame. It’s a lovely scent. Hey, I like how you describe it as “fun”! That’s perfect–although it’s fun in a moody way. oh Angela! now I must smell it! I wonder if it will call up old black-and-white movies for you–or anyone else–too? In any case, it’s an interesting one! I haven’t smelled any of the Masque Milano line yet, and I’m going to make an effort to do it. As for retro as the new oud, count me in! I’m not remotely interested in any Amouage perfume, I find them too dramatic and a bit on the unaffordable side – yet, I can’t resist to your reviews. So beautifully written, you give to all these PR people a run for their money! I know just what you mean by “dramatic.” Sometimes with a perfume, I can feel like it’s wearing me, rather than the other way around. I only tried this for the first time yesterday. I’m totally smitten. I love your review, although I must admit I didn’t really get any ash tray. Just narcissus on steroids. Nice! Have you tried Masque Milano Romanza? That one’s a nice narcissus, too. No I haven’t, but I will look for it. I love narcissus in perfume. It’s a note I’ve really been loving, too.